17 January 2019 (Toronto, ON) - On February 1st 2019, celebrated Swedish quintet The Cardigans will be issuing all six of their studio albums on vinyl, two of which will be available on wax for the very first time: the band's head-turning debut Emmerdale; plus, the last album of their spellbinding 1991-2005 creative output, Super Extra Gravity. The collection will also feature world-dominating titles from their illustrious back catalogue including Life (1995), First Band On the Moon (1996), Gran Turismo (1998), and Long Gone Before Daylight (2003). All albums have been remastered at Sterling Sound studios in New York and will be pressed on gatefold 180g gram vinyl. The announcement directly follows the band’s triumphant UK shows this Winter, which celebrated the 20th anniversary of the Platinum-selling album Gran Turismo. Their first dates in the country since 2006, media including The Guardian praised the “glorious” live highlights, testifying to a band whose enduring appeal continues to shine today. Formed in the small village of Jönköping, Sweden in 1992, The Cardigans are a Swedish pop rock band who met as teenagers and would go on to find world-wide success. With six critically acclaimed studio albums to their name, the band have sold over 15 million albums worldwide to date, scoring multiple hit singles and award nominations in the process. The band’s music has been prominently featured on a number of film soundtracks including A Life Less Ordinary, The X Files and perhaps most prominently on Romeo + Juliet which featured the international hit "Love Fool". Taking a hiatus after their 2006 tour, the band reunited in 2012 to play several concerts and continue to perform to dedicated audiences across the globe. 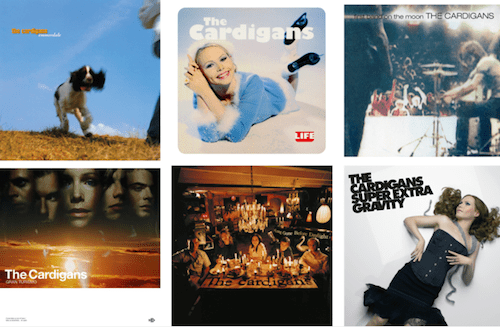 The Cardigans will re-issue their entire back catalogue on vinyl, some for the first time ever, next month. The Cardigans are a five-piece who met as teenagers in Jonkoping, a small Swedish town in which the only distinguishing feature is its fifty-two churches. In October 1992, bonded by their mutual love of hard rock music, guitarist Peter Svensson and bassist Magnus Sveningsson conceived The Cardigans. As their hometown was hardly a Mecca of musical enterprise, the group packed up and moved to the somewhat more central fishing port of Malmo, Sweden's third largest city, to seek their fortune. With Peter writing most of the music and the band as a whole composing the lyrics, the quintet set out to find a deal. After an early recording of "Rise & Shine" appeared on a local independent label in 1994, The Cardigans were swiftly signed to Stockholm Records. The same year the band made their debut for the label with Emmerdale and later won the accolade of Best Album of 1994 from Slitz, at the time Sweden's leading music magazine. The rise of The Cardigans has since been gradual, allowing them the time to develop naturally as their sales and positive exposure grew with each release. Their second long-player, Life, which followed in 1995, featured the hit singles "Carnival" and the re-recorded "Rise & Shine", and witnessed the band's first international chart success. Prior to the First Band On The Moon album in September 1996, The Cardigans released "Lovefool". Although the first response to the single was very positive and landed them in the Top 40, it achieved nowhere near the impact that awaited it the following Spring. It was in 1997 that The Cardigans were first catapulted towards international superstardom. "Lovefool”’s inclusion on the blockbuster Romeo + Juliet film soundtrack that Spring pushed them past the boiling point. The single not only reached No. 1 in both the UK and US airplay charts but also debuted at No. 2 in the UK national chart, where it remained Top five for five weeks. All in all, the album reached more than 2.5 million sales worldwide, achieving Platinum status in the US and Japan and Gold in the UK. The promotional activities supporting the worldwide success of "Lovefool" and First Band On The Moon were never ending. The band not only performed a yearlong world tour complete with endless radio sessions and press and television interviews, but even ended up making guest appearances on Beverley Hills 90210 and the David Letterman Show. It was because of the sheer exhaustion resulting from such a schedule, that The Cardigans took some well-deserved time off at home in Malmo to recuperate their artistic juices and write new material. During their time off, however, the band was by no means dormant. In the beginning of 1999 they contributed a new track, "War", to the A Life Less Ordinary soundtrack, a live recording of "Been It" to the Lilith Fair compilation and "Deuce", featured on the new album, to the X-Files soundtrack. Their break also included experimentation with various solo projects. In June 1998, the group, who are very loyal to their roots, once again joined long-time producer Tore Johansson at his studio, Country Hell, located beside the picturesque Svaneholm Castle in Malmo and recorded the album, Gran Turismo. The first single, "My Favourite Game", was a major hit in many territories. The video for "My Favourite Game" was directed by Jonas Åkerlund. The second single "Erase/Rewind" was released in January 1999 also turned out to be a major hit around the world. Gran Turismo reached more than 2.5 million sales worldwide. The album Long Gone Before Daylight was released in February 2003 and from the album the singles “For What It’s Worth” and “You’re The Storm” were taken. The album received great reviews and the band spent most of 2003 touring Europe and North America. Super Extra Gravity followed in 2005 and featured “I Need Some Fine Wine And You, You Need To Be Nicer” and “Don’t Blame Your Daughter [Diamonds]”.